Truckee, CA United States - Halverson 049 (SL) | Donner Lake Realty, Inc. The Halverson unit is 2 bedroom (3 sleeping areas), 1 bath, sleeps 6. Located on the West End of Donner Lake on the quiet street of Ute Drive. From the good sized deck there is plenty of sun with mountain views. 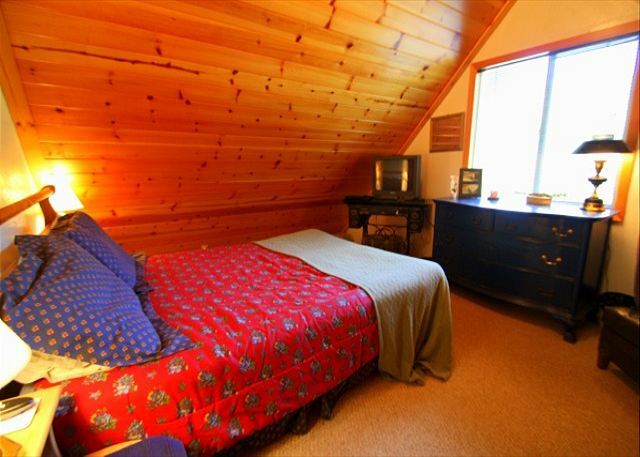 As you enter the cabin, downstairs are the living room, dining area, and original kitchen. Relax by the fire or take a quick walk to the lake. The laundry room, full bathroom, and main bedroom with a Full sized bed are also connected to the living room. As you go upstairs there is a divided sleeping area. On one side of the stairs is a Queen size bed, on the other side of the stairs is two twin beds. This big room is great for kids and offers some privacy. 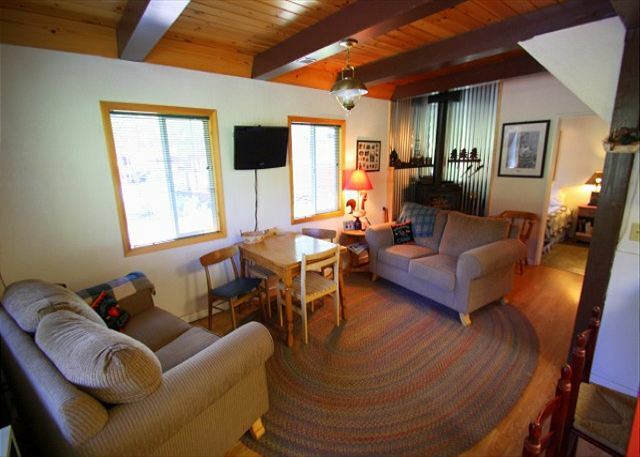 This unit is a summer short term rental and a winter ski lease. For the summer of 2016, this unit will rent for $800 per week low season - $950 per week high season or $180 per night low season - $210 per night high season plus cleaning fee, 12% tax and refundable security deposit. This cabin has a two night minimum for summer reservations. Our units do not have sheets, pillow cases, or towels included in the rental, guests are requested to bring their own. However, we do offer linen rental service with 72 hrs notice before arrival: sheets, pillow cases, and towels at a onetime fee of $10 per person. Check in time is 3pm and check out time is 10am. This house will have a renters access card for the DLPOA homeowner beach, a daily admission fee of $5 per person will still apply.